Eurolanche brings you an exclusive interview with Slovak goalie and Avalanche draft pick Maximilian Pajpach. Maximilian Pajpach is a product of the ice hockey program in his hometown Poprad, where he spent his entire career thus far. Making his way through the youth categories, Pajpach earned himself a spot on Poprad’s junior team. He’s also part of Slovakia’s national junior team, playing several games in the highest Slovak league, in which the junior team takes part. Pajpach shined while playing for Slovakia’s U-18 team. He had a memorable game at last year’s Ivan Hlinka Memorial Tournament, stopping 53 shots he faced against Russia. Pajpach has so far played in weaker squads, which hurt his personal stats. North American scouts were very impressed by his individual skills, which he could showcase even under such conditions. 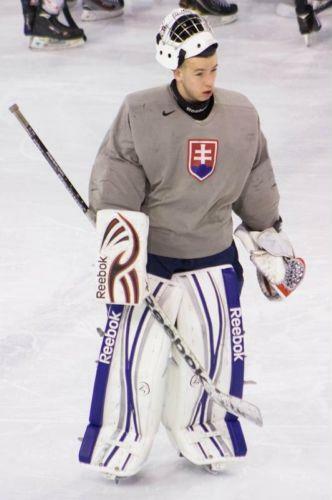 The young goalie became the only Slovak drafted, after the Colorado Avalanche drafted him 174th overall. His plans for the next two years are clear. He’ll play for Tampere’s juniors team in Finland, which he hopes will be a good starting point on his way to fulfilling his dream – to play in the NHL. You were the only Slovak drafted this year. What’s it like to essentially be declared the best Slovak in your age category? I don’t really think it’s like this, like being the best Slovak, but it’s a great feeling nonetheless. I’m a bit sad that I was the only one drafted, because I have a lot of skilled teammates in the teams I play for. On the other side, it’s an even bigger honor to be drafted. How were your honest expectations before the draft? Did you more or less believe it would happen? I believed it would eventually happen, but I wasn’t really relying on it, I wasn’t sure I would be drafted at all. It was more like hoping than expecting. I really wasn’t overly confident anyone would select me. Did you think of a list of teams you’d like to be drafted by? My favorite childhood team, the St. Louis Blues. I was even joking before the draft that their 176th pick would be me, but the Avalanche eventually drafted me 2 spots sooner. I also like the Avalanche; it’s a great opportunity for me. How did you know the Avalanche drafted you? My Slovak agent gave me a call. He told me everything via phone. I wasn’t watching the draft. The Czech representative of my agency, who was personally at the draft, called me afterwards. I also spoke with the Canadian representative. What was your first reaction after your agent told you? I read that you’re studying at the moment. How’s it going? I still need to pass some exams next week, so I’m still learning. I was hoping I’d get drafted, but I didn’t want to just wait until they did. I didn’t want waste time, so I was learning. I have to finish third grade and I want to graduate next year, but I really don’t know how I’ll do it, since I’ll be in Finland. I’d like to finish school, because I think it’s a good thing to do. I had good results at home in Poprad, it would be a shame to just throw that away. Did you get to celebrate last night? I celebrated with my friends and family. Have you already looked up any info about the Avalanche, which you didn’t pay attention before? I looked at some basic info, how the arena looks like, how the weather is and stuff like that. Do you already know the club’s goalie situation? They have Varlamov and Berra in the NHL, Aittokallio and Pickard in the minors and several other goalies, including recently signed Roman Will. Do you have any experience with any of them? Obviously, they have great goalies, but I don’t have any experience with any of those guys. It means that I’ll really have to improve. Has anyone from the organization contacted you? Not yet. Based on what my agent told me, they should contact me within the next day or two. What do you know about the team? I know Patrick Roy, he was my hero growing up. I liked his stickwork, his aggressive and bold style of play. I’m really glad he’s coaching there now. Did his play inspire you? Do you try to emulate his style of play? I don’t really try to imitate his play style, because he played in a different era after all, so it wouldn’t really pay off. But he’s really an inspiration for me. Do you already know about any plans for the summer, which would take you to the development camp in Denver? I don’t know anything about that yet. First of all, I’d like to finish school next week and I should fly to Tampere, where I signed a deal, on July 20. I should have time for some rest before that and it’s back to work afterwards. You spent the majority of your career in Poprad. The roster wasn’t really that good, which showed on your stats. How do you think did you impress the North American scouts? Not my save percentage, that’s for sure. It was really inconsistent. I talked to a number of scouts and they told me that I have good stickwork and read the play well. I’m one of the taller goalies and I’m really mobile. Did you know the Avalanche were interested in you? I didn’t know about their interest at all. I talked with a couple of people from other NHL teams. Do you regret your decision to stay home in Slovakia instead of going to North America to play in the major juniors? I don’t regret it at all, because I wanted to stay home until I was 18 and go somewhere else afterwards. I didn’t really think about Canada or the USA because of that. You have a lot of experience playing for Slovakia’s national junior teams at international tournaments. Are there any unforgettable games you played in this category? Most likely the game against Russia at the Ivan Hlinka Memorial Tournament at the start of the season. It was the best game I ever played for me personally and it’s certainly etched into my mind. Then maybe the game in Switzerland, where we played the Finns and won. You recorded more than 50 saves against the Russians. How’s it for a goalie, when you face this amount of shots compared to “classic” matches? I don’t think I really realize it that much. I was surprised after the game when they told me how much shots I’ve faced. Maybe it’s because they were so many shots. It’s kind of easier when you’re facing 50 shots compared to 20, because it kept me in rhythm. When I’m facing fewer shots, I’m kinda just standing around and I’m more prone to making a mistake. You took part in the Ivan Hlinka Memorial Tournament. Do you remember any sound names that were drafted Friday and you had to face off against them? Adrian Kempe (drafted 29th overall) played for Sweden, as did William Nylander (8th overall). Aaron Ekblad (first overall) played a practice game for Canada. How would you sum up your last season? The beginning was good, then I got injured, which sidelined me for a longer time. After I returned to the ice, I went down with another injury, a knee injury, during practice. I wouldn’t necessarily say it was a bad season, it was fairly okay. Yes, I’m already practicing and I’m about to hit the ice as soon as I get to Tampere. How did you get an offer to play in Finland next season? Tampere’s goalie coach saw me at a tournament and followed me afterwards. He contacted me via my agent at the season’s end and told me, they have an offer for me. What are your expectations of this league compared to your experience in Slovakia? Mainly, there’s a whole different kind of work with the players and different practices. The league’s certainly on a higher level than here. I don’t really know where I’d play if I stayed in Slovakia, but it’s certainly better there. What’s the length of your contract? Two years plus an option for another year. Do you think you’ll have a chance to prove yourself in the NHL or at least in the AHL after your contract expires? Yes, I’ll do everything I can and I really hope it will happen sometime. I’ve learned that your performance got better because you started to wear contacts. Do you still use them? Is it common for hockey players to use them? I still use them, I can’t really imagine not wearing them. I know about a lot of goalies, who wear them. You don’t get to choose your eyesight and they really help. You’ve reportedly won a World Junior Championship, but it wasn’t a hockey championship. It was a ball hockey championship in 2012 and I was supposed to be at this year’s championship, which is in Bratislava, but I couldn’t because of my knee injury and I was also in Finland. 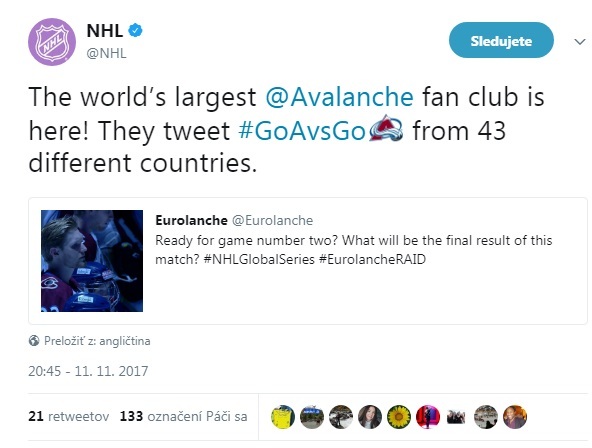 Did you hear about the European fan club of the Colorado Avalanche, Eurolanche? Yes I did, I looked at some pictures on the internet. I saw that you have some photos with players and some photos from games. The interview was done by David Puchovsky. We’d like to thank www.slovakprospects.com, Slovakia’s biggest prospects and Slovak and foreign junior league website, for the photographs.